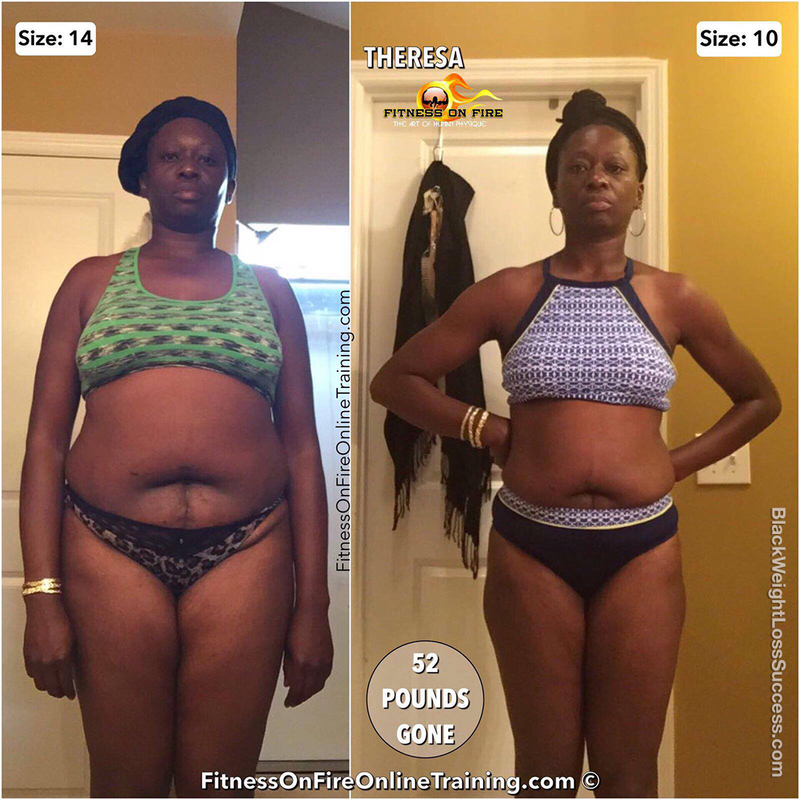 Update Dec 2017: Teresa wrote in to share that she lost one more dress size. Now, her total weight loss is 54.8 pounds. Check out how she did it. How have you maintained your weight loss/continued to lose weight? Remaining committed to my workouts and meal plans has helped me to maintain my weight loss. With continued support from the Fitness on Fire team, I continue to not only lose weight, but gain muscle as well. For me, healthy eating habits have not been hard to maintain. Remaining consistent with when it comes to nutrition keeps you on track. When it comes to exercise, consistency is the key. What lessons have you learned on this journey so far? Throughout this journey I have learned to never give up, to stay positive, and to ignore negative comments. The overall change in my body has helped me with my self esteem. I feel like that stands out the most. At this point, would you offer any new or different advice to other people who want to lose weight? For anyone who is struggling with weight loss, I wouldn’t recommend any other program other that Fitness on Fire. 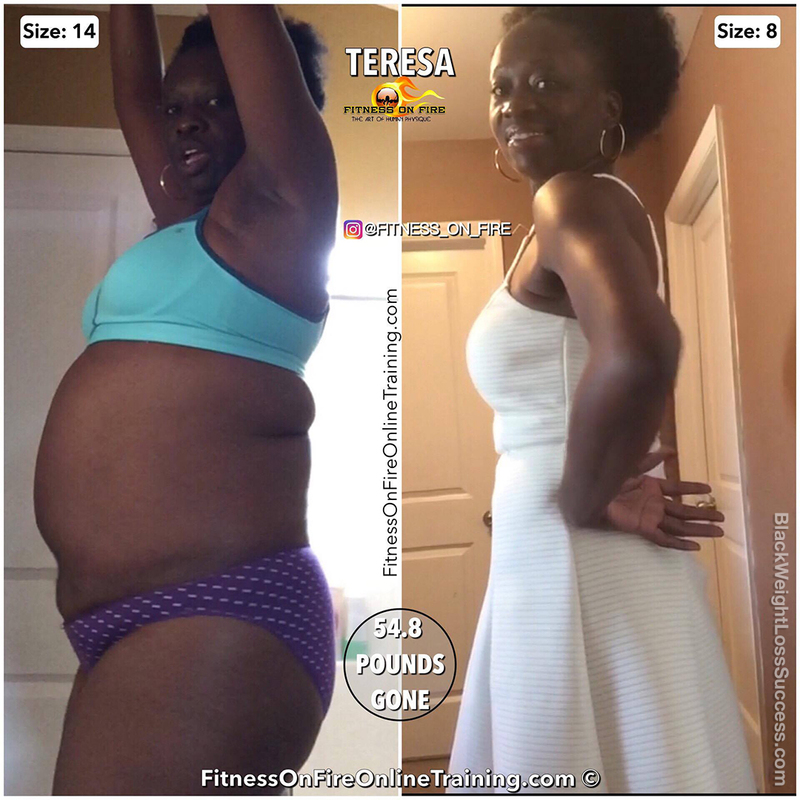 Transformation of the Day: Teresa lost 52 pounds. Now, she is free from worrying about hiding rolls or love handles, and she’s hearing lots of complements on her progress. Check out how she took action through healthy eating habits and lots of exercise. What inspired you to start your weight loss journey? My inspiration came when I looked back at some previous photos and noticed how much weight I’d gained over the last couple of years, compared to my high school days. That’s when I was as inspired to make a change. My motivation is the enjoyment of feeling comfortable in my own skin. It feels amazing to be able to get dressed and not have to worry about hiding rolls and love handles anymore. To have friends and family members complementing me on my weight loss also keeps me motivated. Changing my eating habits was not easy, but I was determined. I try to say away from negative energy and I’ve learned how to say no. I gave up fast food, junk food, fried foods, beef and pork. I started eating healthy vegetables, turkey, fish, chicken and consuming at least 80 ounces of water per day. My workout consisted of resistance training based on the exercise regimen given to me by my online trainer, King of the Fire. I worked out for at least an hour and thirty minutes each day, sometimes seven days a week. My very first workout was on April 20, 2017, I started to notice a change in about four to six weeks. The transformation took about five months. I would advise anyone who is interested in losing weight to first consider using Fitness on Fire, the program is amazing and you will have all the support that’s needed to remain consistent with your journey. The Fitness on Fire Online Training Program worked for me because of the support I recieved. Even though everything was done online, it was like having the fitness team right there by my side. They don’t bite their tongues and if you get off track they have no problem with keeping you focused!